Located in stunning Darling Harbour, Adina Apartment Hotel Sydney Darling Harbour offers luxury accommodation on the King Street Wharf. Boasting excellent facilities, easy access to public transport and stunning harbour views, the hotel is just minutes from popular attractions such as Sydney Aquarium, The Star Sydney casino and the Entertainment Centre. An attraction in its own right, Astral Tower and Residences at The Star offers luxury accommodation in New South Wales' only casino in a stunning waterfront location on Pyrmont Bay. Featuring 24 hour entertainment, this premier venue features the ultimate in accommodation and facilities conveniently close to major Sydney attractions. More than 100 years old, this former woolstore now offers modern accommodation behind an historic façade at the Holiday Inn Darling Harbour. 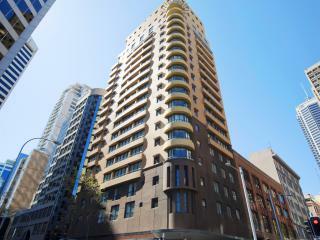 Boasting an excellent range of facilities and amenities, the hotel is conveniently close to a range of attractions including Cockle Bay, the Capitol Theatre, Chinatown and the Sydney Aquarium. 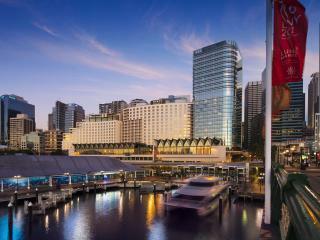 Located amid Cockle Bay and Kings Street Wharf on Darling Harbour, Hyatt Regency Sydney offers luxury accommodation and a fantastic range of onsite facilities. One of Sydney's largest hotels, there are a fantastic range of shopping and dining options as well as major tourist attractions nearby. Offering affordable accommodation at its best, Ibis Sydney Darling Harbour boasts a convenient range of onsite leisure facilities, easy access to public transport and excellent value accommodation all within walking distance of popular attractions such as Sydney Aquarium, The Star Sydney Casino and the Powerhouse Museum. Enjoying a stunning location close to Darling Harbour, Ibis Sydney King Street Wharf offers fresh comfortable modern accommodation surrounded by some of Sydney's top attractions. 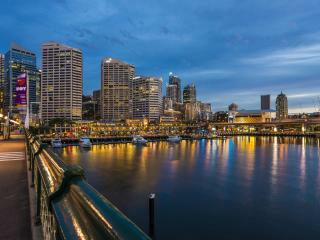 The hotel is just minutes to the Sydney Aquarium, the CBD, The Rocks and plenty of cafes and restaurants. Located on the harbour of the city fringe, Metro Apartments on Darling Harbour offers budget friendly accommodation without sacrificing on comfort or quality. Surrounded by cosmopolitan shopping and dining, the hotel enjoys easy access to public transport and is within walking distance of popular Sydney attractions. Located in the cosmopolitan harbour precinct, Novotel Sydney Darling Square offers elegant accommodation close to the CBD, International Convention and Exhibition Centres and Cockle Bay. Enjoying a great range of onsite facilities, the hotel is conveniently close to shopping, dining and public transport. Located in the heart of the harbour precinct, Novotel Sydney on Darling Harbour offers luxury accommodation and a fantastic range of facilities surrounded by Sydney's best shopping, dining and attractions. Conveniently close to public transport, the hotel is just minutes from many attractions includding SEA LIFE Sydney Aquarium, the Chinese Friendship Gardens, the Australian National Maritime Museum and more. Offering a unique blend of modern comfort and neo-classical history, Oaks Goldsbrough Apartments features comfortable accommodation in a heritage listed former woolstore complete with original tallowwood flooring and exposed ironbark columns within easy access of shopping, dining, transport and attractions. Located on the city side of Darling Harbour, PARKROYAL Darling Harbour offers luxurious modern accommodation within walking distance of the CBD and Cockle Bay Wharf. Surrounded by a wide range of shopping and dining options, the hotel is also close to a range of major attractions. Located midway between the CBD and Darling Harbour, Seasons Harbour Plaza Sydney offers comfortable, spacious accommodation near the city's shopping capital. Conveniently close to dining, public transport and popular attractions, the hotel enjoys a great range of onsite facilities right across from Darling Park.